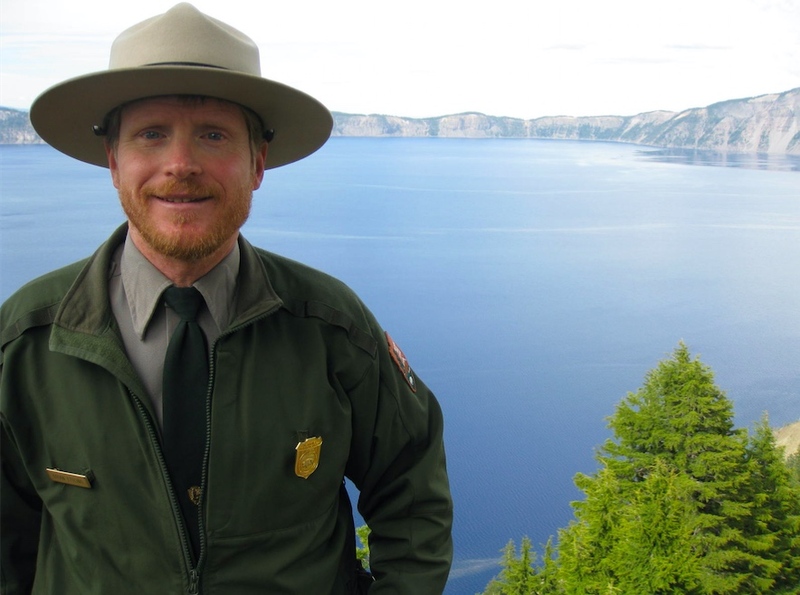 Brian Ettling wears many hats: the Smokey Bear Stratton of a National Park Ranger, some cool driving/cycling caps, and the Green fedora of a citizen spokesperson for the (international) Climate Reality Project. Brian talks to Earthworms today by phone, en route to his summer seasonal ranger gig at Crater Lake National Park - where one of his interpretive duties is to talk to visitors from around the globe about the issue of Climate Change. What are some conversational keys to engage one's fellow humans with this topic, especially when the guy you're talking to is convinced it's all a hyped-up myth? And how can HOPE always figure in to a topic that's so huge it freezes up people's capacity to care and respond? Brian Ettling has worked this out - as you, dear Earthworms listener, will hear, and can see in some of his personal postings. This conversation also says HAPPY CENTENNIAL to our U.S. National Park Service, in the first of this year's Earthworms spotlights on this jewel of nature and culture. Music: Cadillac Desert - performed live at KDHX-St. Louis by William Tyler. Around our world, artisans in all media are able to thrive because of stores like Zee Bee Market, a proud local member of the Fair Trade Federation. St. Louis retailer Julio Zegarra-Ballon, a native of Peru, melliflously articulates the principles of fair trade in this Earthworms conversation. Goods Julio has brought to the KDHX studio embody collaborative relationships between seller and maker, to develop product lines both novel and useful. These exchanges go beyond protection, to enhance the social, economic and environmental well-being of global cultures, sources of Zee Bee's wares. Located at 3211 South Grand Boulevard - in one of St. Louis most vibrant business districts - and online, Zee Bee Market is a delightful and ethical shopping destination. Thanks to Stacey Bernard, host of Backroads, Saturday mornings on KDHX, for introducing Earthworms to Zee Bee Market and its owner, Julio Zegarra-Ballon. Music: Infernal Piano Plot, performed live at KDHX by the Claudettes. Head south in St. Louis to Cherokee Street for a new celebration of Earth Day at The Blue Pearl. Owner Julie Sommers and friends are gathering music - speakers - poetry - great food and drink, and Green activities for kids to celebrate our Blue Planet! Festivities start at 3 p.m. on Friday April 22 - EARTH DAY! One special speaker is Earthworms guest Tabitha Tripp, a life-long tree lover, dirt worshipper and resident of Southern Illinois. Tabitha reports on issues - and the beauty of her part of her state - from the Heartwood Forest Council and SAFE, Southern Illinoisans Against Fracturing our Environment. She shares some original, personal poetry from her activist experience. In her spare time, Tabitha is a mom, a poet and painter and one hellacious cook. Other Blue Pearl Earth Day speakers will address Pop-Up Prairies, Cool Roofs, Energy and Nuclear Waste issues - and much more. Music will jam up all spaces! Cherokee is one of the liveliest, oldest, most diverse street scenes in town. This year Earth lovers will flock there - and rock there! Hope to see you there too! Earthworms' KDHX listening area is rich in water, surrounded by rivers, blessed with (thankfully) abundant rainfall - yet do we SEE these priceless resources around us? Artists Libby Reuter and Sun Smith-Foret are about to open our eyes. Libby and Joshua Rowan continue to join their sculptural and photographic forces in the eloquent project Watershed Cairns, water marked with art. Libby's glass sculptures are created to be photographed by Josh in sensitive or damaged or simply glorious watershed locales. This multi-year creative flow has built a stunning body of work, seen in St. Louis and other cities. Sun Smith-Foret's new Riverwork Project incorporates river images by 60 regional artists in a regional, multi-racial collaboration that has produced a 300-foot long pieced, layered, painted and embroidered textile. Riverwork is also designed to pack up and travel - upstream, downriver and into the minds and hearts of viewers. See Water will be exhibited at the St. Louis Artist Guild - 12 North Jackson in Clayton, Missouri - opening reception 5-8 pm on Friday April 22 - EARTH DAY! - and on view through May 12. Join a Walkabout with the artists on Wednesday May 4, beginning at 6:30 p.m.
How will you See Water after seeing this work - and hearing this Earthworms conversation? Artist Sarah Loynd creates around sustainable themes - and wears her messages, boldly. Her media ranges from an invasive plant to villages in Greece abandoned as bauxite mining takes over, to humane concerns for both cows and children. She doesn't flinch from tough topics as she fashions (literally) head-turning pieces. About to earn a BFA from Maryville University, Loynd's work in the Studio Art 2016 Senior Show will be on view April 11 - May 12 in May Foundation Gallery on the Maryville campus in Chesterfield, with an opening reception on April 14, 5-7 p.m. "Creative Eradication," her bush honeysuckle gown, was recently on view at the Missouri Botanical Garden. Music: Abdiel - performed live at KDHX by Dave Black.